Chen Chieh-jen, Empire’s Borders I, 2008–2009, 35-mm transferred to DVD, color and black and white, sound, 26 minutes 50 seconds. This compelling exhibition presents six unique related videos and films that beautifully combine art, documentary, and politics to chronicle one of the most profound humanitarian crises facing Europe today. The no-frills installation here—two galleries are empty save for several video screens and a few chairs—allows for the direct, indeed inescapable contemplation of individual suffering under indifferent geopolitical structures. 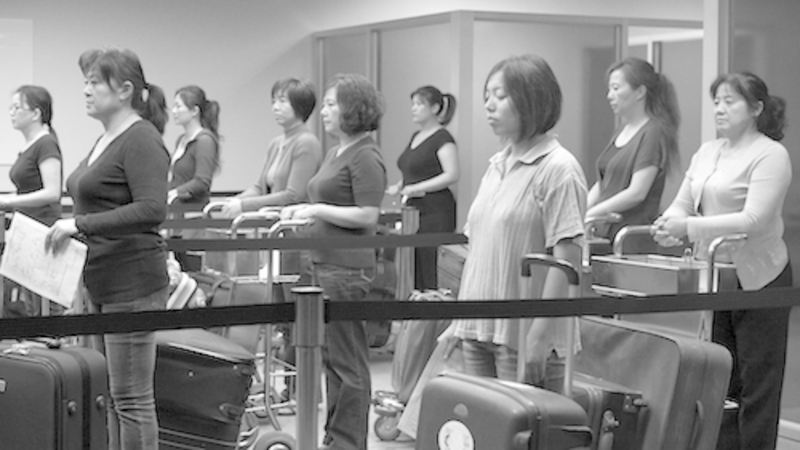 The first gallery is devoted to Taiwanese artist Chen Chieh-jen’s film Empires Borders I, 2008–2009, a quietly elegant color and black-and-white epistle re-creating actual Taiwanese citizens’ unsuccessful interviews for obtaining travel visas to the United States. In the second gallery, the video The Land Between, 2014, by Australian filmmaker David Fedele, features the daily lives of African migrants who camp out in the mountains of Morocco waiting for their chance to cross into Spain. The Indian Turkish filmmaker George Kurian’s The Crossing, 2015, depicts the arduous land and sea journey undertaken by a group of Syrian refugees as they flee their war-torn homes for Europe. Kurian dexterously includes footage shot by one of the refugees, Rai Armouni, which provides us with an intensely intimate account of the frightening and dangerous situations the group finds itself in, as well as the friendships, humor, and dignity that the men, women, and children share. By focusing on the larger political issues at stake in the vast migration along the Balkans route last year, selections from the video Moving Europe, 2015, by the transnational network Welcome to Europe, serve as a powerful foil for the narratives of Chieh-jen, Fedele, and Kurian. These works showcase the sheer range of realities displaced peoples experience, while also reminding us that to have a better life is a universal human desire.